The 1" Cordless Mini Blind is engineered using static and crease resistant aluminum slats, designed to spring back if pulled out of shape. These cordless metal mini blinds feature a roll formed steel headrail and bottom rail to provide maximum support for the smooth up and down cordless operation. The cordless metal blinds also feature a modern sleek headrail eliminating the need for valance slats, although two slats and clips are provided. The Cordless 1" Aluminum Metal Mini Blind is easy to install and ships complete with hardware, wand for tilting, inside/outside mounting brackets, and instructions. While being high quality, these cordless mini blinds are the cheapest we offer and at discount prices. 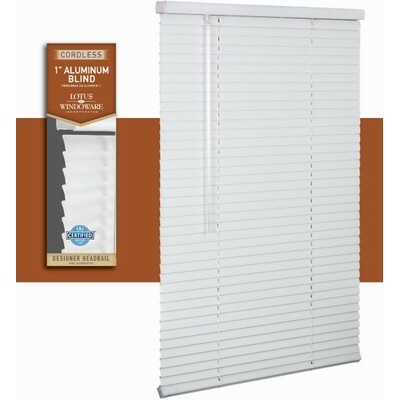 Our 1"cordless aluminum mini blinds come in standard sizes that are boxed and ready for immediate shipment. The aluminum cordless metal blind chart below shows the length in bold followed by all the available standard widths. The stock discount priced cordless mini blinds are an excellent choice for home, office or apartment buildings. Custom cutting options are available. Click on Size for Pricing All widths are 1/2" less than stated size to allow for inside mounting. Lengths are exactly as shown and are easily shortened, with installation directions included in box showing you how. Click on size for pricing.